For the fifth year in a row the Bridge Film Festival will be presenting films at the Quaker Youth Leadership Conference in Durham North Carolina on Friday, February 2nd. This year the conference is hosted by Carolina Friends School with help from New Garden Friends School. 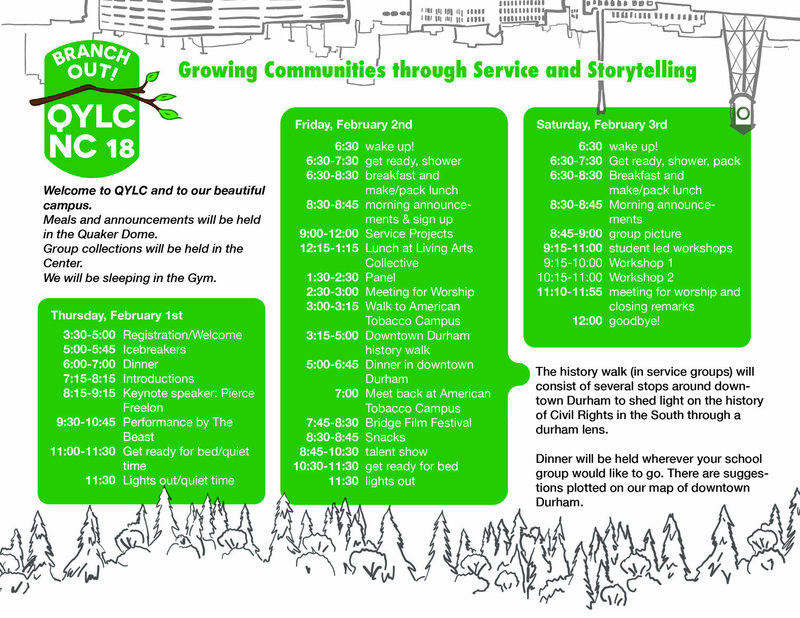 The theme of the conference this year will be "Growing Communities through service and storytelling. A perfect fit! A selection of films, reflective of the conference theme will be chosen from the Bridge Film Festival YouTube Channel and screened at the event. Since 1999 the Quaker Youth Leadership Conference has invited six upper school students and two faculty members from Friends Schools worldwide to a three-day gathering of learning, service, worship and fun. Although the name of the conference is a bit of a misnomer because the vast majority of attendees are not of the Quaker faith, I consider the QYLC to be the preeminent gathering in Friends education. Each school selects their students in their own unique way. While the students may come from very diverse places, at the conference there is an notable atmosphere of respect and celebration of the individual as well as of our shared values. If your upper school has not attended this extraordinary event in the past, there is never a better time than now to sign up and join this celebration of community!